Situated on a small organic arable farm with miniature donkeys and young highland cattle, Linnet is a cosy cottage furnished to a high standard. 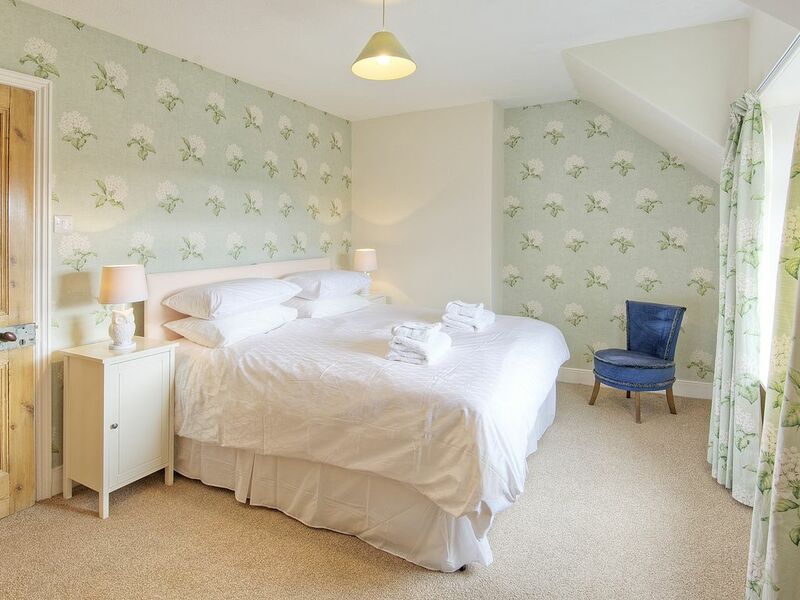 All bedlinen, towels, heating, electricity and wifi included in the rental price. A starter pack of toilet roll, tea towels, cleaning stuffs, tea/coffee etc will be provided for your stay. A maximum of two pets per booking. The groundfloor is open plan with a sitting-room, dining-area and kitchen. The shower room is located off the sitting room. The first floor has a large master bedroom with superking size bed (optional layout of two singles) and fabulous views out to fields. There is also a single bedroom. Thornton Farm Cottages are perfect for a get-away-from-it-all holiday! There will always be fresh flowers, our own eggs and a pint of milk in the fridge ready for your arrival. Thornton Farm is 5 miles south west from Berwick-upon-Tweed. It is a short drive from Norham Village with Norham Castle, a great pub and local shops. Our nearest pub/restaurant is 1 mile from the cottage. Cheswick Sands is 15 minutes by car and offers fabulous walks along some of the most deserted and beautiful coastline in Great Britain. We can offer guest passes to Paxton House where you can picnic by the River Tweed, visit the art gallery or walk along to the Chainbridge. Guests are welcome to meet our miniature donkeys or help collect eggs. We like to leave you in peace and so everything is on offer, but never put upon guests. There are wonderful walks around the farm and guests love to bring their cameras for wildlife watching. Laura Smales looks after Linnet Cottage. The Smales Family farm at Thornton and live on site. Thornton Farm is a beautiful part of the world. The beaches near us are outstanding and there is so much to see and do locally. We love Etal and walking along the River Till. Linnet Cottage has lovely views from the bedroom. Thornton has a wonderful landscape and even though you are 3 miles from a shop it can feel like a total escape. A Mira power shower and a gorgeous green slate floor. Unlimited biomass heating and hot water included in the rental price. We only use high quality bed linen and a decent tog duvet. Parking for two cars a 3m walk from the front door. Fluffy towels are provided. We do all our own laundry. The living room has a two seater sofa and armchair. The kitchen table is off the sitting room and is next to the window, so you can watch the hares running across the field while you enjoy breakfast. 32" wall mounted flat screen tv with freeview. Lots of guidebooks and leaflets for inspiration. A bag of toys is available on request. Small enclosed garden with seating and table for two. Linnet has secure storage to park two bicycles next to the cottage. The cottage was lovely. Very comfortable bed. Nice hot shower with towel warmer. It was a perfect place for us on our way up the coast. Very cosy practical cottage! and a very comfy king size bed! Peaceful farm location. Thank you for taking the time to leave a review. I am so happy you enjoyed a peaceful week away. The Autumn sunshine is glorious this morning. We hope to welcome you both back again very soon. It's always a pleasure to host you at Linnet Cottage. Fantastic break in Linnet Cottage at Thornton Farm. Very well equipped cosy cottage, with massive bed! Brilliant peaceful location, just a few miles from the beautiful Northumberland coastline. Laura was very helpful in the booking process, telling me all we needed to know and always a speedy reply. I would not hesitate to recommend to a friend. We will return! Thank you for your kind comments. It's great to hear you hope to return. I look forward to welcoming you back to Linnet Cottage in the future. Quite rural location. Comfortable cottage with open farmland view . Comfortable cottage in a quiet rural location with views over farm land. Ideal for visiting Berwick on Tweed and the Northumberland coast and Scottish boarder towns. The owner was very friendly and helpful . We will be visiting again in the future. I'm so happy to hear you enjoyed a peaceful relaxing holiday. Please come back some time soon. Comfortable cottage with all the little extras and a really friendly and helpful owner. Great break. Friendly and welcoming cottage. All the extras needed and a really helpful owner. We were really comfortable in Linnet Cottage and would strongly recommend it. Thank you so much for your lovely comments. They are a huge boost to us and your feedback is very important. I hope to welcome you back to Linnet Cottage again. Lovely property . Well kept and clean. We had a very nice stay. Our only problem was stairs (we are quite elderly) and having the bathroom downstairs was difficult during the night. Other than that we had a very enjoyable stay. Laura was very welcoming and the added touches in the cottage all made to a very pleasant week. Cheswick beach is 15 minutes by car. Bamburgh beach is 30 minutes by car. Holy Island is 30 minutes by car. Excellent cycle ways around North Northumberland and Scottish Borders. Berwick-upon-Tweed train station is 5 miles from Thornton. Use of a car is preferable but we have a local bus service, can collect from the train station and taxis cost approximately £15 from Berwick. Berwick-upon-Tweed has a leisure centre with gym facilities and swimming pool. There are 4 supermarkets in Berwick and we can accept an online delivery to either cottage the morning of your arrival. The Plough Inn at West Allerdean is our local pub, this serves good food, real ale all in front of a log fire.